Synopsis: No city boasts of a more fashionable population of bicyclists than London. Photographer Horst Friedrichs meets his subjects in their own milieu: zooming around the city's streets on two wheels. There he encounters a dazzling array of style and a surprising amount of substance. 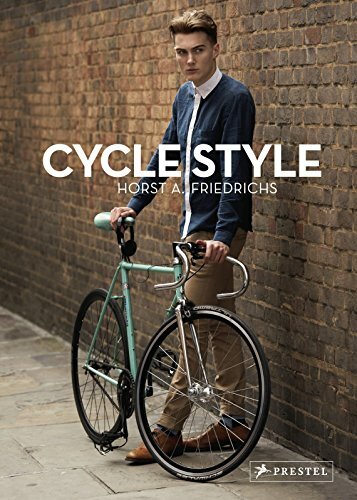 In tweeds (both Harris and hipster) and Saville Row suits, in high-tops and stilettos, in flowing skirts and the skinniest jeans, wildly tattooed and impeccably manicured, sporting bowler hats and racing caps, London's cyclists are jubilantly exercising their fashion freedom. Whether they're leisurely filling their baskets from market to home or pedalling purposefully to an important meeting, experiencing the city as cycling tourists, or getting from place to place in the most economical way possible, Friedrichs' subjects share a love of the bicycle culture that is sweeping the streets of London and the rest of the world. Published by Prestel Verlag GmbH & Co KG.